Would it have changed the course of events in NI? Christmas can be slow enough and, as the turkey emulsifies into excess fat to be sweated off in the gym after New Year’s resolutions, you turn to thinking about the events of the ending year and, in my case, that means checking out old news stories as I toss the trash from my email box. 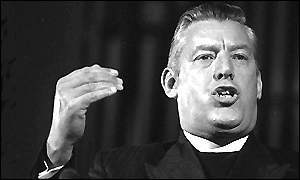 Secret Public Record Office files from 1977 show senior Stormont officials believed Ian Paisley was associated with loyalist paramilitaries. The remarks made by the officials reveal they considered arresting the now first minister for conspiracy. What a revelation , it all makes sense now! Martin and Ian getting on swimmingly while the rest of us thought they were bitter lifelong enemies???? I knew it all along, all the pieces have just now fallen into place. What a cunning plan? WIKIPEDIA also says that Ms Caitriona Ruane MLA, Minister for Education, was a professional tennis player who organised Carnivals….. well, actually that’s true. WIKIPEDIA says Conor Murphy, Minister for Social Development, was a former IRA member who was sentenced to 5 years for IRA membership and possessing explosives…… Apparently that’s true as well. WIKIPEDIA says Edwin Poots Minister for Culture is a farmer……. hmmmmmm that’s true also. Seriously though, can we believe anything we read on the Internet. According to toggle spellchecker “WIKIPEDIA” isn’t actually a word, but some interesting alternatives were offered including WARPED and WICKED….. That toggle spell checker is smarter that I thought! It might be interesting to start a list of duff Internet “knowledge”!